Peerless ACC120 Internal Joist Mount attaches between two ceiling joists above a finished ceiling. 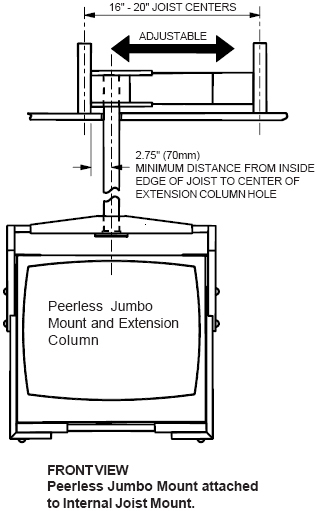 Its expandable design allows for attachment to joists on 16" or 20" centers. The mount features a 1 1/2-11.5 NPS threaded fitting which accepts most Peerless-AV Extension Columns. Because it is adjustable, the installer can fine tune the point of attachment prior to installation resulting in the optimum viewing position for the finished assembly.